Mark McAllister’s strike on the 27th minute decided what was a game lacking in clear-cut chances for both teams. It was enough to keep Linfield four points clear at the top while Crusaders’ inconsistent season continued. The home side’s misery was compounded deep into injury time at the end of the game when their captain Colin Coates was sent off for a second bookable offence following a late foul on Michael Carvill. David Jeffrey will no doubt be delighted at yet another three points and another clean sheet. The Blues have now won their last five league games, overcoming their early-November blip, and have conceded only one goal in the process. Much of the defensive success has been built on the central-defensive partnership of William Murphy and Albert Watson. Often ridiculed for their lack of ability as ‘footballers’, the two have silenced their critics with a string of impressive performances which have laid the foundations for an important run of victories. The two were again magnificent on Saturday – both kept the Crusaders attack subdued and both were prominent contenders for the ‘Man of the Match’ award. The team line-ups have remained consistent and once again Linfield were unchanged at Seaview. Having recorded a 4-0 victory over Carrick Rangers at the same venue two weeks previously, it was imperative that the Blues rose to a much tougher challenge, especially physically, against Crusaders. Not only were Murphy and Watson more than capable of performing admirably against these tactics, but smaller and more technically gifted attacking players also prospered against a slower and more laborious Crues defence. Carvill once again shone and complemented McAllister expertly. The former Dungannon player McAllister put in yet another good shift, capped off with his cool finish after Sean O’Neill had saved a Lowry shot. Linfield’s second half performance wasn’t as fluid or efficient as their first, but they held out without suffering any further scares, and will be thankful for grinding out another win. 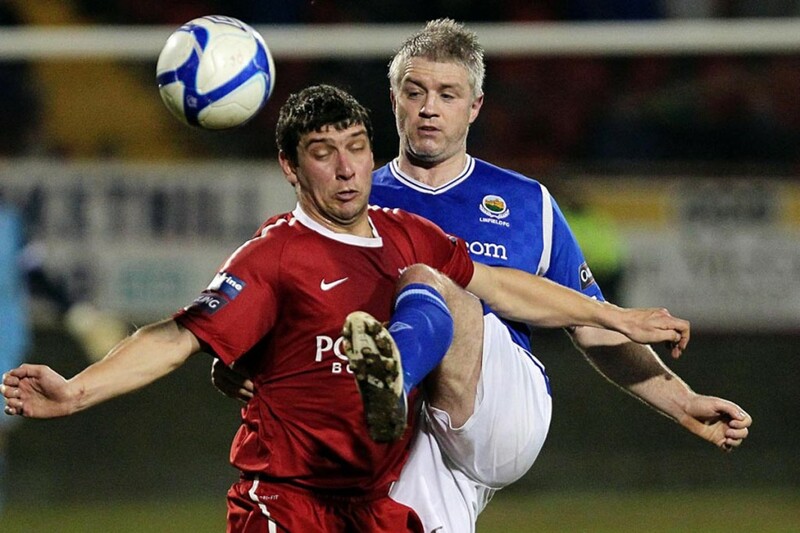 The gap over Cliftonville and Portadown – in second and third places respectively – remains the same. Cliftonville overcame struggling Lisburn Distillery 3-1 at Solitude, while Portadown outplayed Glentoran in their own backyard, eventually winning 2-0. The day will probably be remembered for the managers. It marked Ronnie McFall’s 25th year in charge of the mid-Ulster club, while the shouts for Scott Young to go as Glentoran manager became more audible, and his star striker Gary Hamilton looks set to be unveiled as the new manager of Glenavon. The Lurgan Blues are set to announce the appointment at some point this week, and the new manager will have to endure a baptism of fire as they travel to Windsor Park to face Linfield. The weekend’s comprehensive 3-0 victory over Ballymena United lifted them off the foot of the table, but they will still be massive underdogs facing an on-form Blues outfit. The forthcoming match against Glenavon will see the ‘invite a friend’ campaign – launched by the Linfield attendance committee – come into effect. This means that any Linfield member or season ticket holder can bring a friend to the match, free of charge. This is aimed at not just bringing new fans to the club, but also enticing back those who may have drifted away from the local game over the years. The annual Linfield carol service will take place at the conclusion of the match.